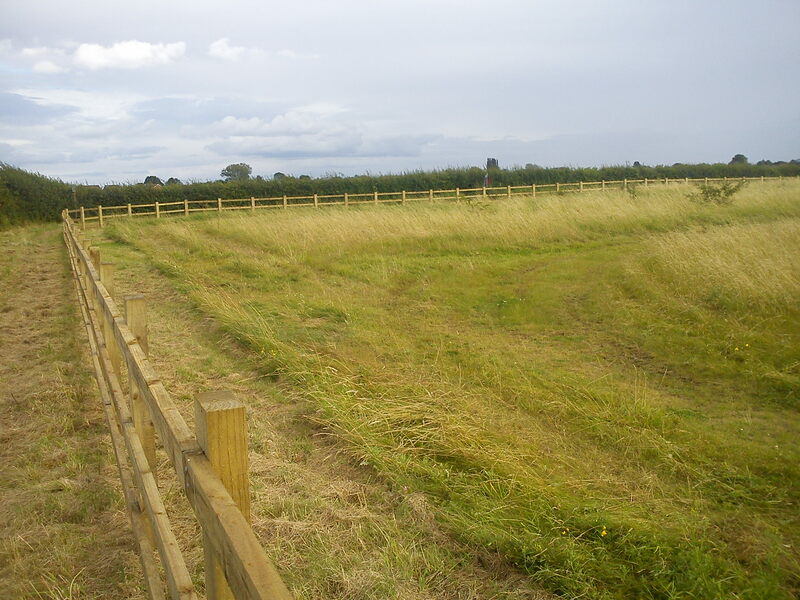 A recent notice on Cranfield University’s intranet site announced that from the week commencing 23 July a new timber post and rail fence were being installed around the North East of the Cranfield airport perimeter. 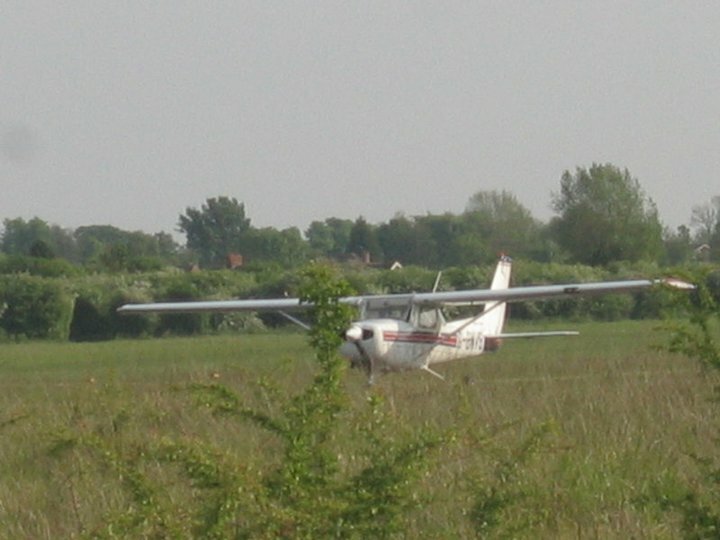 The footpath to Cranfield village is about 2.5km long and it circumnavigates the landing air strip at Cranfield airport. The footpath gets seriously waterlogged during wet weather and becomes unusable, as reported on our website earlier. The footpath is also poorly signposted, especially on the site of Cranfield University – many students and staff are thus unaware of the existence of the footpath and keep walking on the main road between Cranfield University and Cranfield village, risking being run over by cars. Map – footpath to Cranfield village. 3 shortcuts (alternative sections of the footpath) are shown as a dashed line. 1. The first shortcut from the direction of Cranfield University (shown on the map as a curved dashed line) that is near the former air shelter is now not possible to undertake, unless you go under the new wooden rail fence. 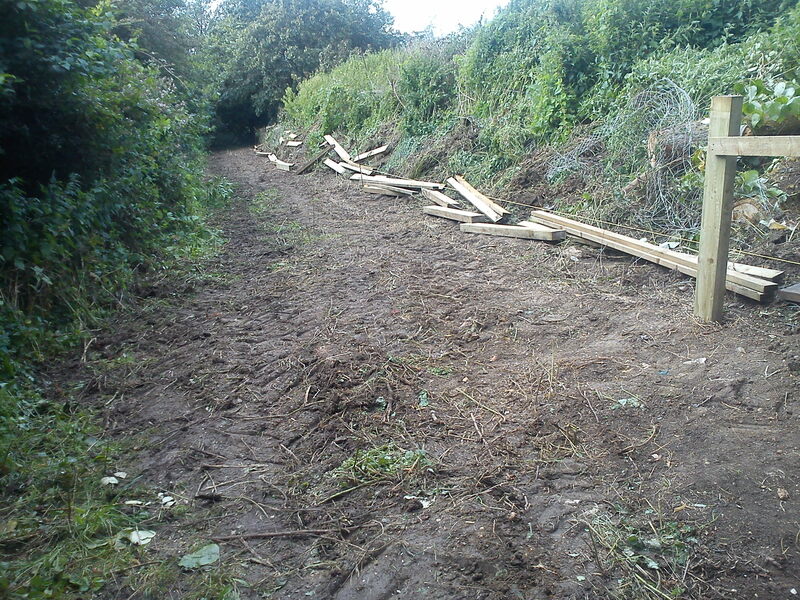 However, where previously the footpath was very narrow as running alongside the former air shelter – this area has now been cleared, bushes felled down and the footpath was made wider, which is a welcomed improvement. 2. The second shortcut ( shown on the map as a dashed line near the stiles) is still possible to follow. It allows to avoid going over the stiles and means walking parallel on the other side of the hedges before sharply turning left back onto the “official” part of the footpath. Cranfield University Walks would like to see this part of the footpath to become a fully recognised section of the route – that allows the footpath to Cranfield village become stiles-free. This section is already used by runners who wish to avoid the stiles and in the future could be used by cyclists, if the surface of the footpath ever gets turned into a cycle route as we are told, the university has been lobbying for this to happen. This shortcut – visible as a footpath right to the fence – is now blocked by the new wooden fence. 3. The third shortcut on the other side of the runway away from Cranfield University, on the side of Cranfield village, is now blocked by the new fence. The new wooden fence extends the full length to the hedges, beyond the shortcut, and adds a good couple of hundred meters to the route. 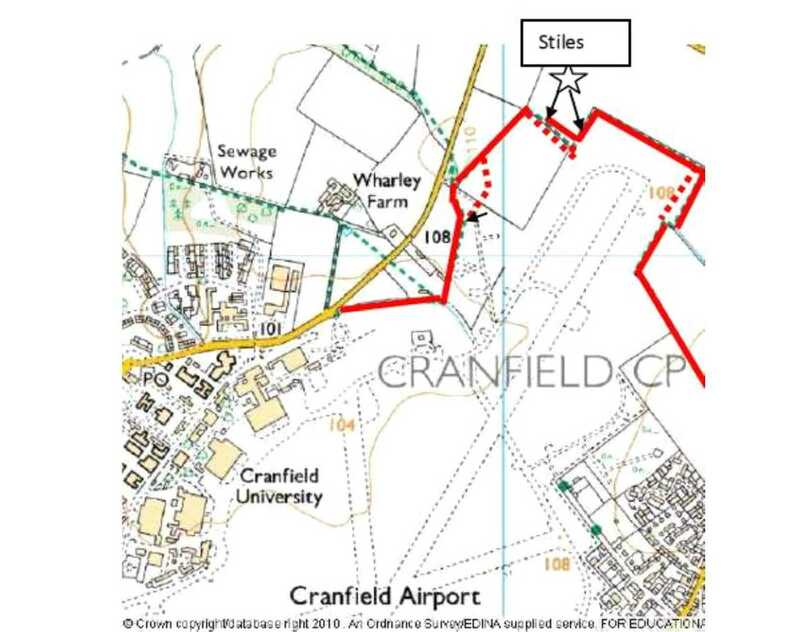 Whilst it is pleasing that some attention – even if only as a side effect of the airport improvement works – is being given to the footpath to Cranfield village, an almost a 3km long wooden fence circumnavigating Cranfield airport and the footpath is not what is really required here. Instead, the footpath from Cranfield University to Cranfield village needs desperately better signs, better lighting and improvement to the surface of the footpath so it can be fully usable all around the year. 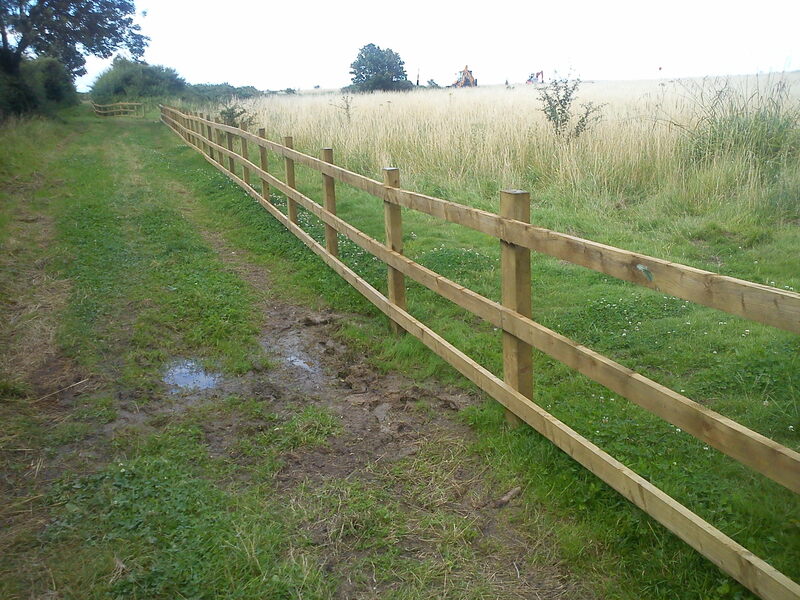 New wooden fence around Cranfield airport. July-August 2012. Widening of the footpath to Cranfield village near the former air shelter. This entry was posted in Blog, Walks and tagged airport security, Cranfield airport, Cranfield University, Cranfield village, footpath, footpath obstruction, footpath to Cranfield village, walking, walks.